PROCLAD Academy’s Next Generation Leadership Development training course is intended expose participants to a comprehensive range of different leadership approaches to understand themselves and to transform them as leaders within their organisations. The principles and practices they learn in this training course are based upon foremost authorities in the field of leadership. 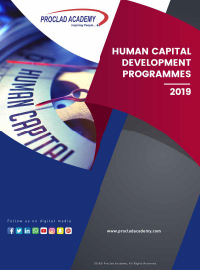 Participants will also acquire skills to manage negative emotional behaviours and insights that can be used in different areas of their professional and personal lives. PROCLAD Academy’s Next Generation Leadership Development training course will be presented in a fast-paced and highly dynamic style. The training methodology includes content lectures, personal assessments, videos and many activities and exercises to make the lessons come alive.